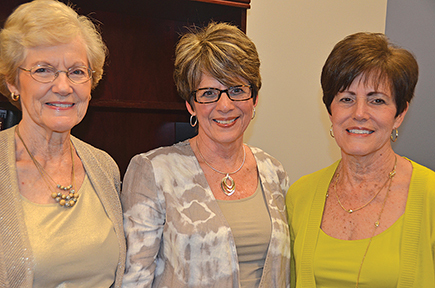 The Roach sisters of Woodbury -- Martha Turner, left, Betty Smithson and Frances Rich -- celebrate Smithson's 49-plus years of service to MTSU during a retirement gathering in her honor in Keathley University Center. MURFREESBORO -- More than 100 friends and well-wishers -- from the MTSU campus and across the region-- helped celebrate Betty Smithson's final working day at the university. On the eve of flying to California for a family visit, Smithson retired Tuesday (April 28) after nearly 50 years at the university. There were many hugs, lots of laughter and no tears as an era came to a close in the Office of the Vice President for Student Affairs in Keathley University Center. Smithson is the last of the Roach sisters from Cannon County to retire. She spent 49.5 years, retiring as an administrative assistant to Vice President Deb Sells and ending a combined 142 years of dedicated service by the three sisters. Eldest sister Martha Roach Turner, who started in 1958, retired after 45 years in what became the Career Development Center. Taking a sabbatical from the university in 1960, she referred her sister Frances Roach Rich as her replacement. Rich retired with 48 years of service, completing her tenure in the Office of the President. Smithson considered all the memories a half-century of service holds. "Working with students ... involvement with them, and being able to help people" is how Smithson recalls her MTSU years, which began in 1965 just after graduating from Woodbury Central High School. "I enjoyed all MTSU football and basketball games. This has been a great thing for my family." Former Student Government Association presidents Shane McFarland and Toby Gilley, now respectively Murfreesboro's mayor and General Sessions Court judge -- value their friendship with her. "Betty was my mom away from home," said McFarland, SGA president in the 1994-95 academic year. "She was the go-to person if you needed advice or help. She was one of my fondest MTSU memories." "She was like a best friend and sister and mother, all rolled into one," said Gilley, SGA president in 1992-93. MTSU President Sidney A. McPhee said the university benefited from (the Roach sisters') years of caring and loving people. "The lives you all have impacted would be in the thousands," he said. As for Smithson, McPhee said: "Betty, you have been absolutely outstanding." He added her "responsiveness and attentiveness" are tremendous traits, telling her family, friends and co-workers she always would have Sells return his calls almost immediately. Sells called Smithson "a good friend. She taught me the Betty Smithson way to do things. ... She made a huge impact on the SGA students and every student who ever entered the office." The president told Smithson that as she enjoyed her trip to California she should "think about all the people you impacted. We are truly grateful -- and you just can't replace that." He said her "responsiveness and attentiveness" were great traits. As for leaving any unfinished work, Smithson said, "Not too much, actually. I've done a pretty good job knocking it out." As the clock trickled past 4:30, Smithson and a colleague collaborated on closing the book on her work and her time at MTSU. With wonderful parting gifts and memories, sunny California and retirement appears next on her agenda.